You are invited to join the Cold Spring Area Maennerchor on this voyage of discovery to classical Greece and the isles of the Aegean. In the 2012 Sing With The Gods Tour of Greece you will ravel back to the ancient civilization that formed the roots of the Western World. Discover Athens, the Parthenon, and the crooked narrow lanes of the Plaka. Visit monasteries perched on enormous rocks in Meteora. Marvel at the archaeological sites of Corinth, Mycenae, Epidaurus and Delphi as you explore the Peloponnese Penninsula. Travel the seas as you visit the jewels of the Aegean - Mykonos, Kusadasi, Patmos, Rhodes, Crete and Santorini. Attend concerts by the Cold Spring Area Maennerchor in local and historic venues. Enjoy this eclectic adventure and return home with memories to last a lifetime. Please take a moment to review the tour itinerary, travel information, and Carlson Wagonlit Travel Terms and Conditions before you register. Click the "Register" tab above when you are ready to submit your information to join this exciting tour. If you have any questions, please contact Carlson Wagonlit Travel at (800) 533-0324. Please submit your online registration as soon as possible to reserve your space on this exciting tour. We look forward to sharing this adventure with you! CLICK HERE for more information... "Maennerchor Sing With The Gods Greece Tour"
Departure day - travel overnight from your home city en route to Athens, Greece. Arrive into Athens. Meet your guide and travel by motor coach to Nauplia. Visits to Corinth and Mycenae en route. Overnight in Nauplia. Tour Epidaurus and visit Nauplia. Cold Spring Area Maennerchor performs the first concert of the tour in Nauplia. Visit the Palamidi Fortress in Nauplia and a local winery with wine tasting. Travel to and tour Delphi. Continue to Kalambaka for overnight. Visit a monastery in the Kalambaka area. Visit a second monastery in the Kalambaka area. Travel to Larissa for overnight and second concert of tour. Travel from Larissa to Athens. Stop at Thermoplylae en route. Overnight Athens. Touring in Athens: the Acropolis (site of the Parthenon) and the National Archaeological Museum. Board cruise ship for four-night Mediterranean cruise. The Cold Spring Area Maennerchor will perform a concert aboard the cruise ship. Today's port of call: Mykonos, Greece. Today's ports of call: Kusadasi, Turkey, and Patmos, Greece. Today's port of call: Rhodes, Greece, for a full-day visit. Today's ports of call: Crete and Santorini, Greece. Cruise returns to Athens. Overnight Athens. Morning departure for your home cities, where you will arrive later tonight. The SJBC Concert Choir departed on Friday, June 27 for the Czech Republic where they will represent the United States and the state of Minnesota at the International Boys' and Men's Choral Festival in Hradec Králové and Prague. 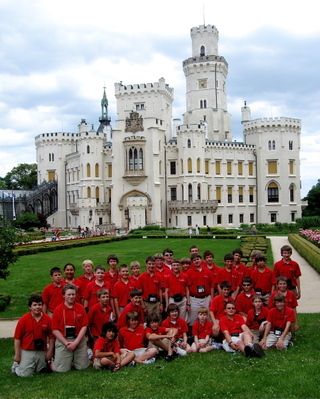 The boys will travel throughout various regions of the country, exploring the nation's architecture, history and culture. This marks the choirs second trip to the Czech Republic. In this video you'll join the boys and their parents as they say final farewells the day of their departure. The concert tour this year is being lead by the Boys' Choir new concert choir director André-Louis Heywood. André Heywood joined the St. John's Boys' Choir staff a year ago. He has a Master of Music degree in Choral Conducting from the Don Wright Faculty of Music of the University of Western Ontario. 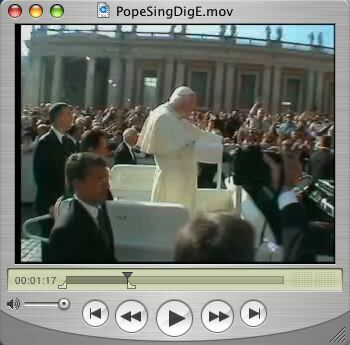 Another special feature of this video story is a short interview with Br. Paul Richards as he reflects back on the very first trip the Boys' Choir took to Europe. It was for 21 days and included a combination of about 30 boys and numerous parent chaperones. This years tour will include 13 days in the Czech Republic. The boys did a great job of dealing with the more than 30 hours of travelling and sight-seeing. They journed first to Hluboka Castle before settling in the hostel at Cesky Krumlov. Lukas Pribyl of Boni Pueri is serving as their guide for these first few days. The day began by attending mass at the Church of St. Vitus. The boys were *excellent*, being very attentive even though they didn't understand a single word. They also tried singing along with some of the Czech hymns. They then spent some time rehearsing in the lobby of the hostel, drawing a number of visitors passing by on the street. After lunch was some time for shopping followed by a tour of the town on wood rafts. The boys had a free evening for socialization. The boys started the day with a silent breakfast (a tribute to Br. Paul pehaps?) and then set off to Hradec Králové, the site of the Festival. They enjoyed a wonderful lunch at the Duran restaurant and then headed into their venue rehearsal at Holy Spirit Cathedral, a 700-year old church in the Old Town square. The boys had a great rehearsal and then spent some time settling into their dorms and having dinner. They then attended the opening ceremonies of the festival, featuring a cameo performance by each choir. The boys were particularly impressed with Boni Pueri, the host choir, and with the American Boychoir who they will sing with in November. Tomorrow begin the long days of festival rehearsals! It's Spring and it's time to start thinking about vacations and places to visit. In this video you'll join the Cold Spring Maennerchor back in 1995 when they toured the British Isles. This is a fun 5 minute tour of Ireland. The music of Ireland will guide you through the cities of Dublin, Cashel and Blarney. See the one and only Molly Malone as she wheels here wheel barrow through the streets of Dublin. Visit a mid-evil castle that is now a museum in the city of Cashel. Chuckle at local Cold Spring natives as they climb to the top of Blarney Castle and then turn upside down to kiss the Blarney stone. Sponsored by the Cold Spring Area Maennerchor who marks its 70th anniversary with the planning of a BIG SING Concert. 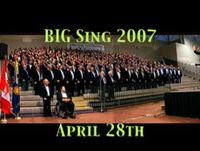 The BIG SING is a joint concert among 12 male choruses - 350 male voices - from Minnesota, Wisconsin and North Dakota, who come together to sing together. This year the BIG SING will be held 7 pm Saturday, April 28, in St. John's Abbey on the campus of St. John's University. Have you ever been to Sturgis, South Dakota? Well there's a motorcycle rally that goes on there every year (now in its 66th year) that is the grand daddy of them all. This story tells about a local version of Sturgis that took place as a part of ROCK-FEST 2006 in Rockville, MN. The Donnie Smith Custom Bike Tour... "Taking it to the Streets" came to Rockville this past Saturday which included hundreds of bikers from across the state.